Aquacultural, oceanographic, and fisheries engineering, as well as other disciplines, require gas solubility data to compute the equilibrium concentration. These calculations, for example, can affect the output of aquacultural production or assist in environmental consulting. Until now, published solubility information has not been available in a consistent and uniform manner in one location. 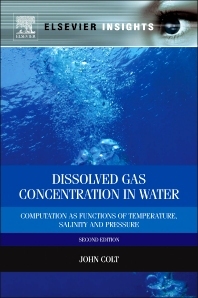 This book presents solubility concentrations of major atmospheric gases (oxygen, nitrogen, argon, carbon dioxide), noble gases (helium, neon, krypton, xenon), and trace gases (hydrogen, methane, nitrous oxide) as a function of temperature, salinity, pressure, and gas composition in a variety of formats. Data, equations, and theory are explained so that the user is able to understand the calculations and problems. Furthermore, data and solubility information are presented in a range of units to make them accessible across disciplines. This book will help the reader to look at a problem from a quantitative viewpoint and better understand carbonate chemistry. Revised from the earlier edition to include more accurate carbon dioxide tables and separate sections on the solubility of noble gases, trace gases, and oxygen in brines to provide a single resource for gas solubility data. This book is essential for all students and practitioners working in aquatic fields.